outreach employees during the summer 1985, peak period of MSFW activity. None of the three offices are currently classified as a significant office by the national office. b. We will continue our efforts to recruit regular outreach staff from individuals with a MSFW background depending on job vacancies. A separate merit classification for Job Service Interviewer 1 requiring bilingual capability has been established, but minimum educational or experience qualifications must be met. Manpower Aide 1 does not have this bilingual requirement, does not require testing and appears to be the best opportunity for recruitment of MSFWs; as most do not meet minimum merit standards for Job Service Interviewer 1. c. Identify and eliminate non-job-related barriers to employment is scheduled bi-annually. Details in goals. d. Production of accurate and up-to-date reporting as a measure of affirmative action plan effectiveness is by a combination of written and personal exit interviews, updating and reviewing the log of new hires, promotions and terminations on a bi-weekly basis. 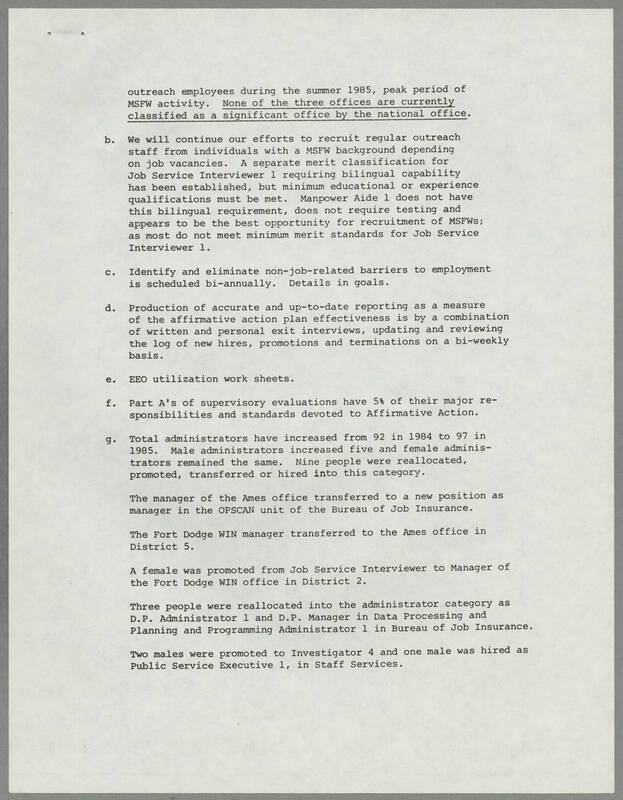 e. EEO utilization work sheets. f. Part A's of supervisory evaluations have 5% of their major responsibilities and standards devoted to Affirmative Action. g. Total administrators have increased from 92 in 1984 to 97 in 1985. Male administrators increased five and female administrators remained the same. Nine people were reallocated, promoted, transferred or hired into this category. The manager of the Ames office transferred to a new positions as manager in the OPSCAN unit of the Bureau of Job Insurance. The Fort Dodge WIN manager transferred to the Ames office in District 5. A female was promoted from Job Service Interviewer to Manager of the Fort Dodge WIN office in District 2. Three people were reallocated into the administrator category as D.P. Administrator 1 and D.P. Manager in Data Processing and Planning and Programming Administrator 1 in Bureau of Job Insurance. Two males were promoted to Investigator 4 and one male was hired as Public Service Executive 1, in Staff Services.